A 22-year-old white male presented complaining of a 3-week history of fatigue, cough and haemoptysis, accompanied by fever (38°C max), dyspnoea and mucopurulent sputum in the last few days. He denied nausea, vomiting, diarrhoea, dysuria and weight loss. He reported being a smoker (10 pack-years) and a cannabis user, and had a history of allergic rhinitis. He denied occupational exposures. Before our evaluation, he received empiric antibiotic therapy for 5 days, which resulted in the abatement of fever. Following the persistence of dyspnoea and haemoptysis, he had chest radiography with multiple nodular opacities associated with pleural effusion on the left (figure 1) and lung ultrasound (US) with a convex probe showing multiple hypoechoic, bilateral foci associated with B-lines and bilateral pleural effusion, mainly on the left. Chest radiograph showing bilateral nodular opacities with a lower zone predominance, interstitial ­thickening and pleural effusion on the left. On our examination, he had no fever. On auscultation, a widespread reduced vesicular murmur and basilar rales in the left lung were found. On palpation, there was inguinal lymphadenopathy. The remainder of the physical examination was unremarkable. Oxygen saturation by pulse oximetry was 93% on room air and blood gas analysis showed a mild hypoxaemia, with an arterial oxygen tension (PaO2) of 61 mmHg with respiratory alkalosis (pH 7.46, carbon dioxide tension 32 mmHg and bicarbonate 23.2 mmol⋅L−1), and therefore with a standard PaO2 of 48 mmHg. Laboratory findings were as follows: white blood cell count of 4140 per μL (54.6% neutrophils, 23.1% lymphocytes and 20.8% monocytes), haemoglobin 13.3 g⋅dL−1, thrombocytopenia (123 000 per μL), increased serum inflammatory markers (erythrocyte sedimentation rate 17 mm⋅h−1, C-reactive protein 18.4 mg⋅L−1, α2-globulin 12.8%, γ-globulin 19.8%, procalcitonin 0.49 ng⋅mL−1 and presepsin 275 pg⋅mL−1), hypoalbuminaemia (3.1 g⋅dL−1), serum iron and ferritin arrangement of chronic disease (serum iron 63 μg⋅dL−1 and ferritin 553 ng⋅dL−1), slight increase in alanine aminotransferase (48 U⋅L−1), and direct bilirubin (0.23 mg⋅dL−1). Renal function and coagulation were in the normal range. What would be your further investigations for a patient with these features? The patient underwent empirical antibiotic therapy and total-body CT; microbiological tests (of respiratory, blood and urinary samples) were required. Total-body CT showed bilateral pulmonary infiltrate with a pseudonodular aspect, with a tendency toward confluence and surrounded by a ground-glass halo, associated with irregular interlobular interstitial thickening and bilateral pleural effusion. Lymph nodes (LNs) with a colliquative aspect were in the epiaortic, subcarinal, hilar and Barety regions with the maximum diameter of 33 mm (figure 2). LNs with increased volume were also observed also in the laterocervical, axillary, mesenteric, iliac, lumbar and inguinal regions. There were no abnormalities in the other abdominal and pelvic viscera. Chest CT (axial view) with parenchymal (a, c and d) and mediastinal windows (b). a) Upper lung fields: infiltrate with pseudonodular aspect, surrounded by a ground-glass halo (red arrow) and axillar lymph nodes (green arrows). b) Middle lung fields: mediastinal lymph nodes (green arrow). c and d) Lower lung fields: infiltrates with pseudonodular aspect with a tendency toward confluence (red arrows), interlobular interstitial thickening (orange arrow) and pleural effusion (blue arrows). What could be the differential diagnoses in the light of the CT report? Bronchoscopy was performed and showed a normal endobronchial mucosa. Biopsy was not performed because of hypoxaemia; however, microbiological and cytological examinations of bronchoalveolar lavage fluid were negative. Tumour and autoimmune (antinuclear antibody and anti-neutrophil cytoplasmic antibody) markers were required. Consent for an HIV test was acquired and US examination of superficial LNs followed the haematological evaluation. US showed rounded lymphadenopathy with chaotic vascularisation in the right inguinal and left supraclavicular regions with maximum diameter of 21×13 mm and 17×10 mmn respectively. Surgical biopsy of the right inguinal lymph nodes was performed and the histological examination result was reported as a morphological aspect consistent with massive metastasis of KS (figure 3). On immunohistochemistry (IHC), diffuse positivity for HHV8 and CD34 was seen in the tumoural area, and that for factor VIII, actin and smooth muscle actin in the rich vasculature. At the same time, an HIV test was positive (HIV-1 gp120, gp41, p24 and p17 were detected), and a T-lymphocyte count in peripheral blood showed no CD4+ cells, and reduced counts of CD3+ and CD16/56+CD3− cells. Tumour markers and autoimmunity examinations were within normal range, except for CA-125 (71.5 U⋅mL−1) and α2-microglobulin (3.34 mg⋅L−1). During the hospitalisation, the patient had fever, which was initially intermittent then continuous, accompanied by deterioration of gas exchange, which prompted an increase in the oxygen therapy. In light of this clinical picture, a diagnosis of KS was made. 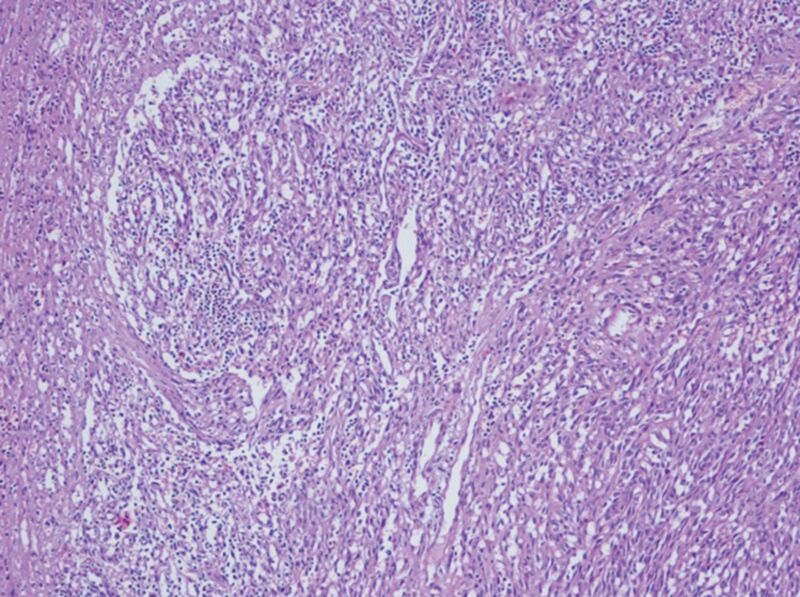 Histological findings from surgical biopsy of the right inguinal lymph nodes: fascicles of monomorphic spindle cells and vascular structure mixed with chronic infiltrates. 100× magnification. KS usually presents with cutaneous lesions but it may involve other organs, mostly in the pulmonary and gastrointestinal systems. Intrathoracic localisation occurs in 20–75% of cases, particularly in severely immunocompromised patients with low CD4+ counts, with involvement of the lung parenchyma, pleura, LNs and airways [6–9]. Reports of isolated pulmonary disease have rarely appeared in the literature (0–16% of cases) [6, 7].Pulmonary KS is associated with poor outcome, but highly active antiretroviral therapy has been shown to markedly improve the prognosis. Common symptoms are dry cough and dyspnoea . Fever and haemoptysis can also be found. Typical radiological features are reticular opacities and parenchymal nodules with a bronchovascular distribution, especially in lower lung zones; consolidation; peribronchial cuffing; pleural effusion; and mediastinal lymphadenopathy . However, chest radiography may be normal. A CT scan is more sensible and specific, and can show irregular, poorly defined nodules with speculated borders and peribronchovascular distribution, interstitial thickening and perinodular ground-glass halo signs (due to haemorrhage secondary to fragility of the neovascular tissue). Irregular narrowing of the bronchial lumen, interlobular septal thickening, air-space consolidation and pleural effusion may be associated with the aforementioned findings [6, 8]. Lymphadenopathy can be present in up to 30–35% of patients. The effusion can be transudative or exudative and is often haemorrhagic because of the vascular nature of the disease . Typical findings on bronchoscopy are red or purple maculopapular lesions that can narrow and obstruct the entire tracheobronchial tree. 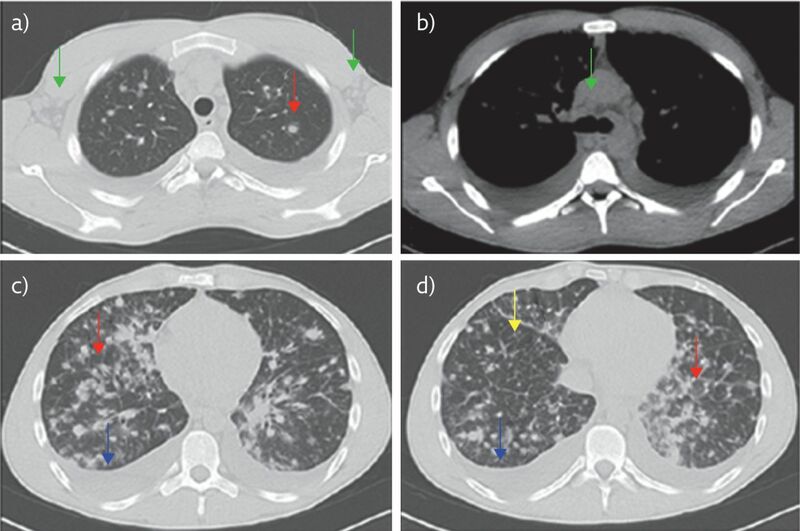 The identification of these lesions in the presence of classic radiographic involvement is sufficient to make diagnosis of pulmonary KS in the absence of evidence for opportunistic infections . Biopsy may be needed when parenchymal lesions occur in the absence of endobronchial involvement . However, the diagnostic yield of endobronchial biopsies varies between 26% and 60% in different studies, and there is high risk of bleeding, especially for centrally located lesions [12, 13]: the decision to obtain a biopsy must be carefully weighed. The histopathology of KS is nearly the same in all variants of disease. Advanced lesions consist of fascicles of spindle cells and vascular structure mixed with chronic infiltrates. On IHC, typical markers are CD31, CD34 and factor VIII-related antigen. Spindle cells express lymphatic markers such as LYVE-1 (lymphatic vessel endothelial hyaluronan receptor-1), VEGFR-3 (vascular endothelial growth factor receptor-3) and Prox-1 (Prospero-related homeobox-1). The most important test to distinguish KS from others KS-mimicking diseases is the identification of HHV8 within KS lesion cells by immunostaining for LANA-1 (or LNA-1) . Pulmonary KS is often indistinguishable from other opportunistic lung diseases in patients with AIDS. 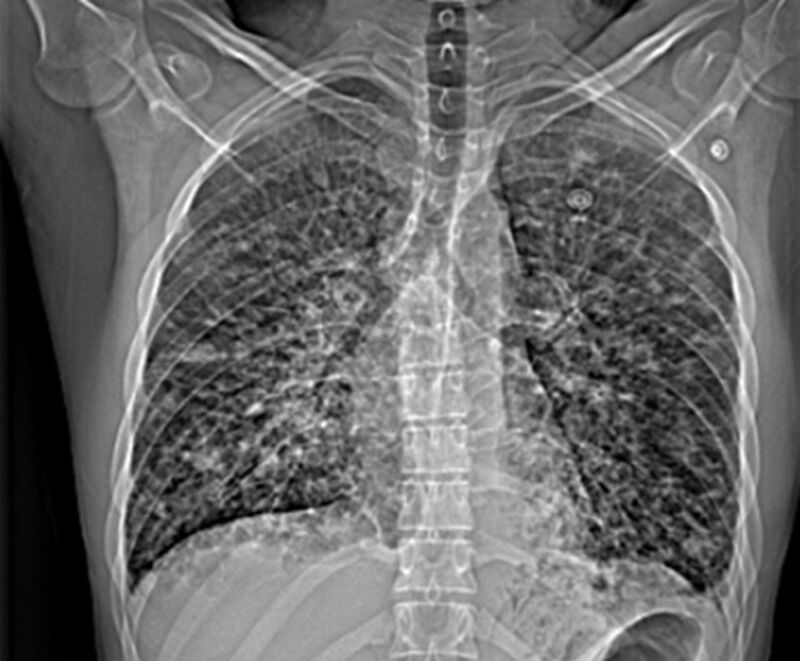 The differential diagnosis of diffuse pulmonary nodules includes: infective disease (tuberculosis or nontuberculous mycobacterial infection, fungal infection, or septic emboli), neoplastic disease (metastasis, lymphoma or minimally invasive adenocarcinoma), sarcoidosis and other miscellaneous conditions (granulomatosis with polyangiitis, pulmonary alveolar microlithiasis and pulmonary amyloidosis). It is very important to evaluate the size and location of nodules, and the presence of cavities [14–17]. The halo sign has been described in fungal, mycobacterial and viral infections; inflammatory disease (granulomatosis with polyangiitis) and malignancy. In immunocompromised patients, this radiological finding suggests an infection (e.g. invasive aspergillosis) or, less commonly, pulmonary KS and lymphoproliferative disorders . In patients with HIV infection, subcentimetre pulmonary nodules with centrilobular distribution and cavitation may suggest infective disease, whereas larger nodules can suggest malignancy . Isolated intrathoracic KS is rarely seen. Moreover, in our case, the diagnosis was made more difficult by the lack of the patient’s knowledge of his HIV infection. Clinical suspicion, accurate radiological description and multidisciplinary management were decisive in reaching a correct diagnosis. , et al. Identification of herpesvirus-like DNA sequences in AIDS-associated Kaposi’s sarcoma. Science 1994; 266: 1865–1869. , et al. Kaposi’s sarcoma in HIV-positive patients: the state of art in the HAART-era. Eur Rev Med Pharmacol Sci 2013; 17: 2354–2365.
. Epidemiology of AIDS related malignancies an international perspective. Hematol Oncol Clin North Am 2003; 17: 673–696.
. Histological variants of cutaneous Kaposi sarcoma. Diagn Pathol 2008; 3: 31.
, et al. Imaging manifestations of Kaposi sarcoma. Radiographics 2006; 26: 1169–1185.
. The epidemiologic, pathologic, and clinical features of AIDS-associated pulmonary Kaposi’s sarcoma. Chest 2000; 117: 1128–1145. , et al. Intrathoracic Kaposi’s sarcoma: CT findings. Chest 1995; 108: 1622–1626. , et al. Pulmonary involvement in Kaposi sarcoma: correlation between imaging and pathology. Orphanet J Rare Dis 2009; 4: 18.
, et al. Pulmonary malignancies in the immunocompromised patient. Respiration 1999; 66: 289–309. , et al. Bronchoscopic and radiologic features of Kaposi’s sarcoma involving the respiratory system. Chest 1986; 90: 476–479. , et al. Pulmonary Kaposi’s sarcoma in the acquired immune deficiency syndrome: clinical, radiographic, and pathologic manifestations. Am J Med 1986; 81: 11–18. , et al. Diagnostic yield of fiberoptic bronchoscopy in evaluating solitary pulmonary nodules. Chest 2000; 117: 1049–1054.
. Diffuse pulmonary nodules. AJR Am J Roentgenol 2010; 194: W354–W366. , et al. Pictorial essay: multinodular disease: a high-resolution CT scan diagnostic algorithm. Chest 2006; 129: 805–815.
. Centrilobular opacities in the lung on high-resolution CT: diagnostic considerations and pathologic correlation. AJR Am J Roentgenol 1994; 162: 569–574. , et al. Guidelines for management of incidental pulmonary nodules detected on CT images: from the Fleischner Society 2017. Radiology 2017; 284: 228–243. , et al. A patient with HIV, dyspnea, and multiple pulmonary nodules: pulmonary Kaposi sarcoma. Chest 2006; 130: 1924–1928. , et al. Clinical and radiographic predictors of the etiology of computed tomography-diagnosed intrathoracic lymphadenopathy in HIV-infected patients. J Acquir Immune Defic Syndr 2002; 31: 291–298.